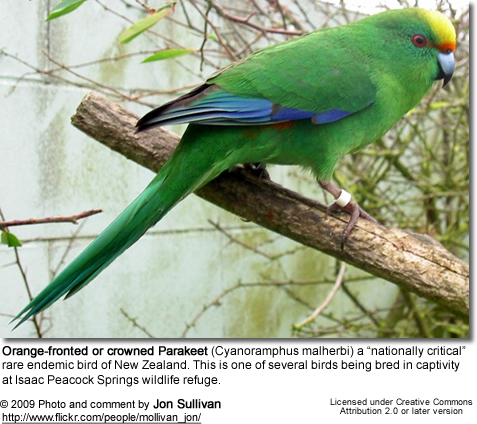 Cyanoramphus is a genus of parakeets native to New Zealand and islands of the southern Pacific Ocean. 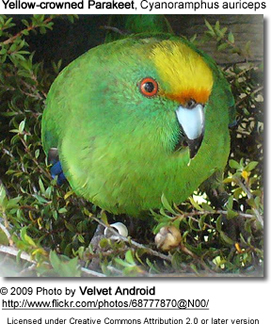 The New Zealand forms are often referred to as kākāriki. The genus formerly had a disjunct distribution, with two species found in the Society Islands and the majority of the genus ranging from New Caledonia to Macquarie Island, but absent from the 4100 km in between. Despite many fossil birds being found in the islands between these two areas being found none of these were of undescribed Cyanoramphus species. They are small to medium sized parakeets with long tails and predominately green plumage. Most species are forest species, although several of the subantarctic species live in open grassland. Like many other species of birds the Cyanoramphus parakeets have suffered from changes brought about by humans. 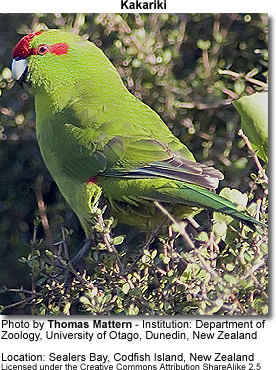 The two species from the Society Islands, the Black-fronted Parakeet and the Society Parakeet, have become extinct as have the subspecies from Lord Howe Island and Macquarie Island, as well as an undescribed form from Campbell Island. One species, the Orange-fronted Parakeet (C. malherbi), is critically endangered while most other species are endangered or vulnerable. Habitat loss and introduced species are considered responsible for the declines and extinctions. Chatham Parakeet C. forbesi (formerly considered a subspecies of C. auriceps). 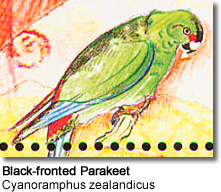 Macquarie Island Parakeet C. erythrotis erythrotis (extinct; formerly considered a subspecies of C. novaezelandiae). Reischek's Parakeet C. erythrotis hochstetteri (formerly considered a subspecies of C. novaezelandiae). 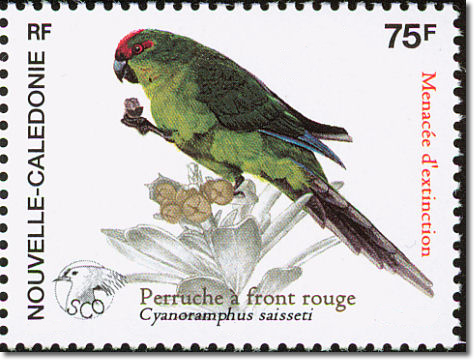 New Caledonian Parakeet C. saisseti (formerly considered a subspecies of C. novaezelandiae). Norfolk Parakeet C. cooki (formerly considered a subspecies of C. novaezelandiae). The two forms of C. erythrotis may be distinct species: the single specimen believed to be from Macquarie Island (Canterbury Museum specimen AV2099, O'Connor catalog 369) in Boon et al. 's analysis has turned out to be from the Antipodes Islands population (hochstetteri) instead. They are usually observed in pairs or small groups in treetops or on outer branches of bushes outside the breeding season. Pairs may remain alone throughout year, but most of these parakeets form small flocks. Copyright: Wikipedia. This article is licensed under the GNU Free Documentation License. It uses material from the Wikipedia.org. Additional information and photos added by Avianweb.